This week’s judge is a feedback lover, community supporter and Modern aficcionado. You probably know him if you attend PPTQs in the Southeast Asia. Meet L2 “Ben” Ferrer in this edition of Judge of the Week! Name: John Reuben Ferrer – this is too long, so other judges just call me Ben. Judge start date: June 14, 2015. I advanced to L2 on August 3, 2016. Why did you become a Judge? I got to know Magic in the latter part of the Theros block during Journey into Nyx. I attended my first Pre-Release event for the Magic 2015 Core Set and there was a judge there, Nick , who was running the pod. I found it really cool that Magic actually has rules experts who assist people at tournaments. It so happened that Nick was a very good “front-of-house” for the game and I eventually began attending sessions/workshops in the PH Judge Candidate Program which he was handling. Nick was very hands on when it came to my journey to L1 and he got his circle of judge friends to be my support group on my road to L2 (Vince Balean , Victor Viguilla , Philip Pena ). It didn’t take long for me to realize I’m part of an amazing group of people. I’m very happy to be a Magic Judge. Commander General: Actually… I don’t have one. But if I did it would be Reyhan, Last of the Abzan. Random fact about yourself: My line of work involves handling reviews of consumer products and services… so, I enjoy reading and writing Judge Reviews as well :). You were nominated for your intense work in the PPTQ scene, particullarly the ones you judged during the last weekend of May and your subsequent involvement with that LGS, helping players familiarize with the Modern format. Can you tell us more about it? Judging PPTQs in the Philippines has been a thrill for me. We have a very unique environment here wherein several of the PPTQs each wave are on different islands away from Manila. These places are normally accessible only by plane and I’m very lucky to have a work arrangement with the company I work for that allows me to fly out on weekends to judge PPTQs. Magic is thriving in the communities I visit. There are many new players and they are really into Standard, which is the format of choice here. However, there was minimal exposure to other formats, particularly Modern and there were many misconceptions about it. There were players who believed that it was broken and unfun. There were those who thought games were always noninteractive and that losing on Turn 1 was the norm. Still there were those who felt cost of entry was too high, and as such, they shouldn’t play it anymore. 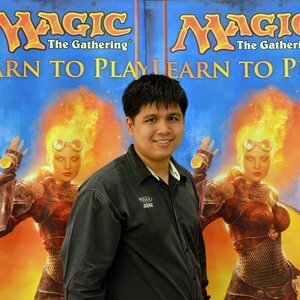 On one of my first few trips to judge events outside of Manila, a Level 1 Judge from Cagayan de Oro (Joe Stutzke ) showed me his Affinity and Naya Burn Modern decks. I had 4 decks of my own at the time and together with a couple of players who had their own Modern decks, we were able to fire a Modern 8-man pod which people enjoyed. That gave me the idea that if only I could make decks available, I could share a different format to the players in the places I visit and perhaps show them that they may have judged the format too quickly. At the same time, I could draw more interest for PPTQs during the Modern Season. So, I began a personal bid to build just about any competitive Modern deck I could get my hands on. I’d aggressively trade for Modern staples and over the past year and a half, a gauntlet of 15 decks were built for players to borrow from and enjoy. I’ve been using the gauntlet for almost a year now. I was also very blessed with highly supportive Tournament Organizers who bent over backwards to put together events that would get players to become interested in Modern. 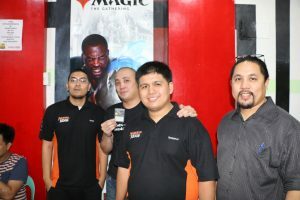 These TOs include 3J Hobby Shop in Dumaguete, Final Turn and G5 Games in Bacolod City, Magus Games in Cebu and Affinity Games in Cagayan de Oro. Every time I go to those cities, they cook up a Modern side event for the players to enjoy in addition to the PPTQ. 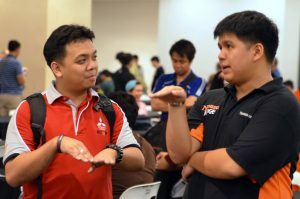 This coming July, the Modern PPTQ season opens and I will be running my first few Modern PPTQs outside of Manila and the TOs I work with will be accepting preregistration for those who will be borrowing from the gauntlet. Hopefully, this initiative will help player attendance in those events and that eventually, the players who experience the format will build their own decks and play within their respective communities. I have made a lot of great friends within the judge community especially amongst the L1 judges I’ve certified. It just so happens that in the Philippines, several of the Magic communities I’ve reached out to are on different islands far from Manila. I travel to these places once every PPTQ wave to judge PPTQs, catch-up with friends and at times, train people who aspire to be judges someday. This type of life has allowed me to travel frequently and I often have a destination set for each weekend. I’m very happy that there’s always something new for me to look forward to every time I visit a place. Still, judge life has led me to approach relationships outside of Magic differently. There are things that I value more now than when I was just starting out as a judge. I value weekdays with my parents as I work from home. I value hangouts with friends, however short they may be. I value the time I spend on my regular job for Consumer Affairs and the friends I keep there. There are many things that I had to learn not to overlook as I enjoyed the “Magic carpet ride” to different places in the Philippines and Southeast Asia. The best part is I haven’t seen everything yet and doors keep on opening. What motivates you to continue being a Magic Judge? It feels good to be on the giving end. 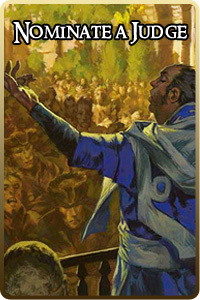 Judges are blessed with knowledge of game rules that make card interactions possible. Judges are also blessed with the knowledge of tournament rules and policy that make smoothly-run events possible. I enjoy sharing what I learn from the Judge Program to the people in all the places I visit. Sure, getting shiny cards every so often is great, along with the relatively frequent travel opportunities, but it’s really the people, the communities I visit and the awesome judges who I learn from within the program that keep me going. Maintain ties with your mentors and mentees in the program. Who did you learn the basics of judging from? Who made you an L1? Who did you first judge a competitive event with? Who wrote a meaningful review for you or recognized you as an exemplar judge for the first time? When the initial adrenaline rush you get from being a certified Magic Judge is gone and it begins to feel like a grind, talk to the people you learned judging from and talk to those whom you have trained to become better judges. Somewhere there, you will find that there is still so much more for you to learn and eventually, you’ll get your spark once again. I was blessed with many. Don’t forget about the non-planeswalkers in your life. It’s very easy to get absorbed by judge work and be consumed by Magic. Take moments to enjoy your “home plane” and the company of people who support your life as a judge even though they might not be able to hold their own in game of Magic. My mom always asks about the tournaments I judge and the places I visit. More recently, other members of my immediate family have been asking as well. Being able to share my adventures (and misadventures) with them has encouraged me to venture out further than I would have thought possible. Judges love to have fun after events especially by playing in events of our own. 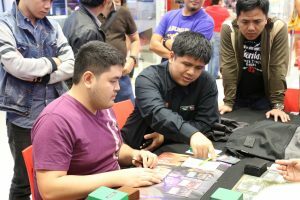 After a Standard PPTQ in Bacolod City in the island of Negros, several judges joined an evening Modern tournament looking to see if we had game against players who visited from other nearby islands. There was a judge match between L1’s Edwin Penafuerte and Ace de Leon . Prior to that event, one of them hasn’t played Modern before (I’ll let you guess which one). Edwin was on UW Control and Ace was piloting a Blue Red Storm deck. After sideboarding, Ace was on the play and opened with a Steam Vents tapped. He passed the turn the Edwin who played a Celestial Colonnade and passed back. Ace topdecks a Blood Moon and with a ritual in hand confidently acted like he was going to win that game at that point. He plays Scalding Tarn, sacrifices it, finds another Steam Vents, plays it untapped and casts Pyretic Ritual into a Blood Moon. He postures defiantly and passes the turn back to Edwin who scratches his head, plays an island and passes back. Ace then tried to cast Sleight of Hand using his Steam Vents while several players watching looked on aghast. Ace then exclaims in the local dialect “IT AFFECTS ME TOO?!?!? !” Everyone burst out laughing. Now who says judges can’t have fun playing some Magic?! Outside of Magic and doing work for Consumer Affairs. I’m also a certified investment solicitor for First Asset Metro’s line of mutual funds. I enjoy talking to people and listening to their plans and ideas for their money. I think financial literacy is very important and that people with money are aware of the different options they have in attempting to beat inflation besides buying Cradles and Duals haha. What positive aspects has the Judge Program contributed to your everyday life? Is there anything else you’d like to add? Being part of the Judge Program has allowed me to always have something to look forward to, whether it is a Grand Prix, an opportunity to be a speaker at a judge conference, a PPTQ adventure somewhere or even just a weekend at home with my family or out with friends. I haven’t had a dull weekend in a while. I’ve received so many blessings as a judge, most especially the people who have supported me and taught me throughout my journey in the program, Alyssa Miclat , Joel Bantiles , Dominic Yu Ping Kun , my RC Wearn Chong , and SEA judge icon QJ Wong to name a few. More recently, I’ve been given opportunities by CFBE, Panda Events and Chain Links to Judge at Grand Prix for which I’m very grateful. Still, I’m very thankful to the game stores who took their chances with me when I was an inexperienced L1: RAXX Hobbies (formerly Robotboi) where I made my first miscall as a judge, DragonForge who somehow kept contacting me even though they already had a more experienced judge at the time, FridayQuest, Vault, Kick Engines, and Tobey’s Game Cafe. If these places didn’t get me to judge GPTs for them back then, then maybe I wouldn’t have the opportunities I have today to judge PPTQs. Lastly, I’m very grateful to the company I work for, Consumer Affairs, for giving me the freedom to pursue judging. I don’t know many companies who give their employees enough leeway to randomly fly off on a Friday morning to judge a Grand Prix or a couple of PPTQs over the weekend. I walked into my first tournament which was a Game Day Event expecting to win using an Intro Pack. My favorite two-drop is Eidolon of the Great Revel. I used to despise the Modern format and stuck to playing standard only. James Hockman made it to the top 8 of that PTQ.